Madison has been discharged from the Yale Pediatric Hem/Onc clinic. This is major news. It's odd that I have mixed feelings about it, but I do. In late March of 2011, we began this journey. I've referenced Madison's ear trouble, and now it's time to finish the story. Stuck in the hospital at 8 months old. At the end of Madison's hospital stay, the ENT had cleared her for discharge, but pediatrics was bothered by her blood tests. They were pretty vague with us, just telling us that a certain white cell count was low - very low. Before they were OK with her going home, they wanted hematology to clear her. Honestly, at the time, we were sort of annoyed by this news. 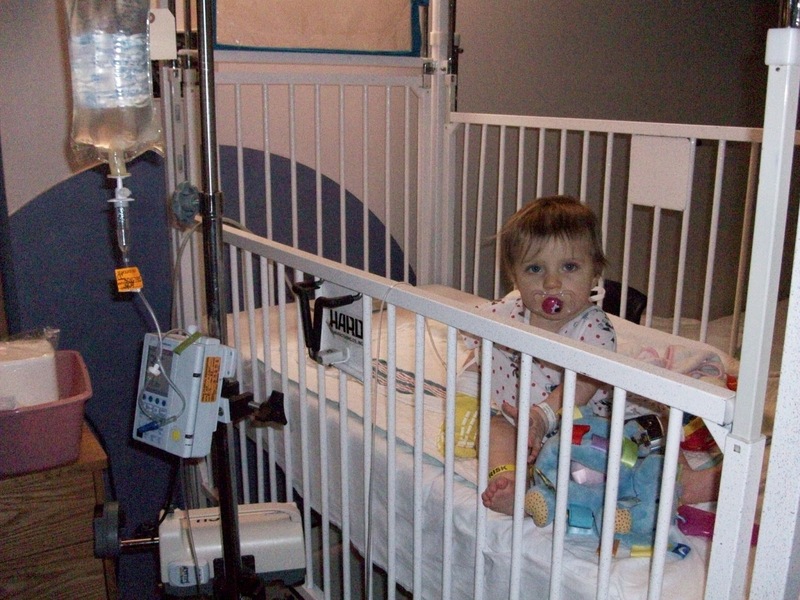 As any parent who has ever had a hospitalized child knows, you don't want to be there unless you really have to. Madison was still nursing, so I was sleeping on a cot in her room. Neither one of us were comfortable in our beds, and we weren't sleeping well. The days dragged, and because of this issue, we were confined to the room. Child life brought in toys, but we were itching to get out of there. When hematology came in, they explained to us what the concern was. We have three types of white cells in the blood to fight infections. Neutrophils fight bacteria. Most children have well over 1500. Under 1500 is considered neutropenic. Under 1000 is considered severely neutropenic. Under 500 is considered critical. Madison had 300. The hematologist we saw told us she would discharge Madison anyway, but we'd need to do some follow up. She was hoping that the level of antibiotics we needed to heal Madison's ears had temporarily lowered her count. Until we knew, we needed to keep her sheltered from germs. For the next two months, our lives revolved around blood tests. Madison hovered between 0 and 300. She was finally healthy, but with no neutrophils, she would have no ability to fight off infection. Which is obviously dangerous. We disinfected everything in our house, and home she stayed. We had to pull her out of daycare, which pulled me out of work. We stopped going to Gymboree. We were kicked out of a Mommy group (they had an attendance policy). When I was allowed to go back to work, I had to take precautions over bringing germs from school home with me. I had to leave my school stuff in the car, change clothes, and wash up before I could interact with Madison. She was at the hematologist a minimum of once a week. We learned a lot about what the different numbers in a CBC with differential meant. We learned about possible genetic syndromes that could cause this. One of our MANY clinic visits, complete with badge of honor on her elbow. 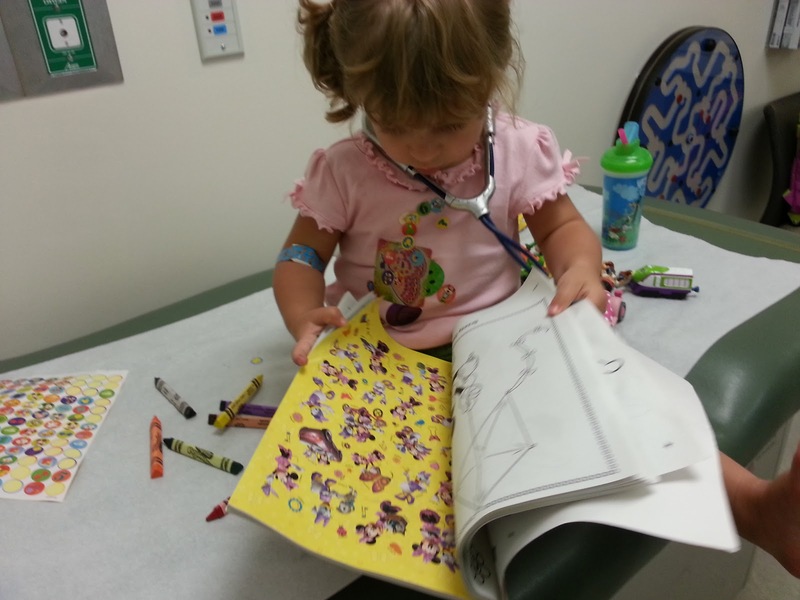 Finally, after a bone marrow biopsy and extensive bloodwork, Madison was diagnosed with - ready? - chronic benign idiopathic autoimmune neutropenia. How's that for a mouthful? For those of you who don't speak medical - her body was killing off these cells for no reason. It killed them off as fast as she made them. The good news about getting this diagnosis? We could finally start treating her. Adam and I learned to give injections, and we injected Madison with a bone marrow modifier that would cause her to produce more neutrophils - hopefully outrunning her body killing them off. It worked. And it worked fast. Madison's numbers skyrocketed. We were out of our home bubble. We were encouraged to be out of the bubble. Just in time for summer. Madison was so happy to be able to interact with other kids, and we were able to join a new Mommy group who was OK with us, and Madison's condition. Adam and I definitely didn't love our job of giving injections, but the payoff was well worth it. There were still some precautions. She was on "newborn" fever restrictions. That meant she needed to be checked - and get a CBC - for anything over 100.4. That was tough. 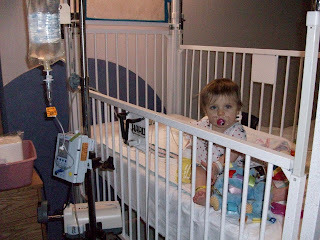 She never seemed to get these fevers during clinic hours, so we had several ER visits and would always end up explaining to the triage nurse that, yes, we knew that 101 wasn't a high fever for a 15 month old, but Madison wasn't a typical patient. We were at Yale a lot. Two blood tests a week. Then one visit a week. Slowly, as Madison stayed stable, we moved to longer breaks. Two weeks. Four. Six weeks. Three months. At this point, after she'd been on the injections for a year, with no hospitalizations, with no consistent dips in her counts, we took a risk and stopped the injections. She stayed stable. And today, just shy of two years from the start of our journey, we said goodbye. I feel odd, because I should be feeling elation. And although I am feeling elation, there's a bittersweet edge. When your child has a serious condition, you come to think of some medical professionals as friends. As family members. The clinic becomes home. We parked on the special Smilow fourth floor of the parking garage and weathered pitying looks as we carried our baby to the clinic. We knew our way to the seventh floor and merely waved to the receptionists when we arrived. We knew that Stevie and Priscilla would be gentle during vitals and knew just how to get blood without setting off a fit. We knew that Joanna and Dr. Deb would spend time with us, watching Madison grow from baby to toddler. When we found out Reagan was on her way, they hugged us and congratulated us. They found a way for us to bank Reagan's cord blood for Madison - an insurance policy - for free. They let us know about special events and the "perks" of being a hem/onc patient. They helped ease the pain by popsicles and apple juice and bubbles and stickers and visits to the toy closet. Dr. Deb lets Madison use her stethoscope and talks to Madison like she was one of her own, and to Adam and I like we were friends. She explained to us what was going on. She let us know when to worry and when to relax. She calmed us. She let us know we could handle this. They will always be there for us. But saying goodbye was still tough. I want to be done, I'm glad to be done, I want my daughter to stay healthy. There are kids who need the healing hands and expertise and calming presence of these wonderful professionals more than we do. But I had tears in my eyes as we walked back to the car today. The end of any chapter is bittersweet. We could not have been happier with the level of care that Madison - and our entire family - received over the past two years. Here are two places that will always be dear to our hearts. If you need place to donate, know that your small donation will make a REAL difference. Toy Closet - When a child at Yale is going through testing, a hospital stay, or any sort of procedure, Yale allows them to select a toy from the toy closet to lessen the sting. Many times tears were avoided, or at least helped, by a visit. They accept new, non plush toys. Kacey Rose - Before we knew Madison had any hematological issues, we donated her cord blood via this foundation. In addition, this foundation sponsors a library at the Smilow Clinic at Yale - quality books to read and keep for patients. In addition, I know I'm paranoid. But if you have a young child who seems to have resistant or recurring bacterial infections, asking for a CBC with differential to look for the ANC is not out of line. I will forever be grateful to our pediatrician who realized that sometimes ear infections are more than ear infections. I'm happy to share more details of our experience with those who need them. Just read this and now I've got tears in my eyes... What a journey, what a strong and loving family, and what an adorable girl you have (or two, as I read the article about the missing piece too... And an angel to care for you) Hugs from Sweden! Oh, wow, that must've been so scary and tough to deal with! I'm so happy for you that your adorable little girl is better!